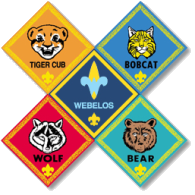 Den Meeting Monday, February 23 at NGRC, 7:00p; Banquet "Centerpiece"
We will have a den meeting on Monday evening. We will be indoors working on the boys' "centerpiece" for their banquet table. The boys will be lashing together a ceremonial ladder to commemorate their Cub Scout years. We'll need some adults to help the boys at a few different stations where they will fuse their rope, practice a round lashing, practice a square lashing, and lash their rung on the ladder. Also, this will be the last den meeting before the banquet where we can credit completed activities. If the boys bring me completed activities on Monday, we can get their pins/patches to them by Saturday at the banquet.